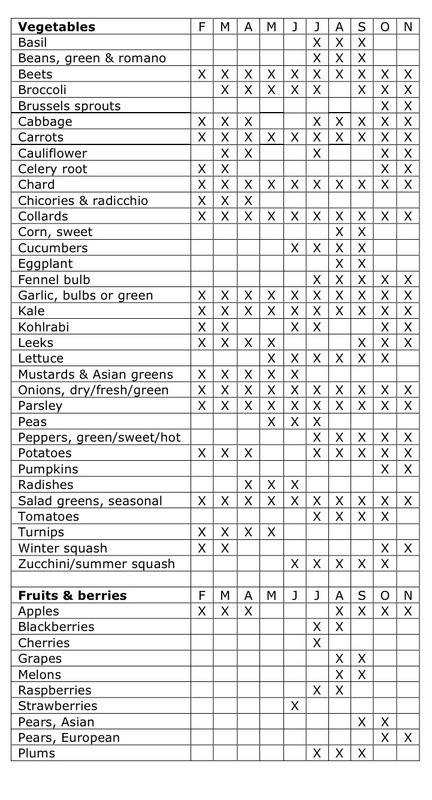 For folks who enjoy a visual guide to the season and our products, I’ve put together this little “schedule” of when different foods are likely to be available through the CSA season. This is fairly accurate to how things grow around here at Oakhill Organics, but every season has its own unique vagaries, of course, based on weather events or different yields. Some of these crops technically can be available year-round (such as beets), but when we are in the midst of the majorly abundant summer season, we may not harvest them as regularly since there is so much other good stuff growing at that time! So, please use this as a guide to the general flow of the year, but expect that some of the details may differ slightly from year to year!